(This is again taken from the scherzo movement of my piano consortium project. Note that the upper staff is in treble clef, the lower in bass clef. Yes, I probably should put a cautionary natural on the F in the bass clef…) Here the second note in the second bar gets a tenuto, like all the notes preceding it. 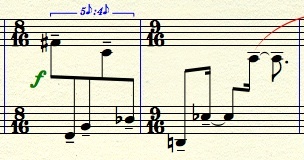 A tenuto note is longer than a staccato, yet not connected to the surrounding pitches. It is perhaps a bit more detached than a mere non legato marking would suggest. The slightly funny looking thing in my example is that there is a note with a tenuto that is supposed to be detached from the note that follows, yet is tied to it. I don’t think this creates any great confusion, but it does look a little odd. I don’t know of an alternative solution, unless I was to beam the second bar in such a way as to not reflect the underlying meter. Speaking of underlying meter, a case could be made for using 4/8 in the first bar above – after all, the figure is 5 in the time of 4, not 10 in the time of 8 – but the measure is surrounded by bars using 16 as the denominator, so I chose to be consistent in that way.